So, the little girl gained a stepmother. After that everything changed. No more bread and jam on the table, no more playing peek-a-boo around the samovar as the girl sat with her father at tea. It was even worse than that, because she was never allowed to sit at tea at all anymore. The stepmother said that little girls shouldn’t have tea, much less eat bread with jam. She would throw the girl a crust of bread and tell her to get out of the hut and go find someplace to eat it. Then the stepmother would sit with her husband and tell him that everything that went wrong was the girl’s fault. And the old man believed his new wife. Therefore, poor Natasha would go by herself into the shed in the yard, wet the dry crust with her tears, and eat it all by herself. Then she would hear the stepmother yelling at her to come in and wash up the tea things, and tidy the house, and brush the floor, and clean everybody’s muddy boots. The very next morning, the old man went off to pay a visit to some friends of his in the next village. As soon as the old man was out of sight, the wicked stepmother called for Natasha. "Hold your tongue," snapped the stepmother, and she gnashed her teeth, which made a noise like clattering tongs. "Didn’t I tell you that you are to go to your dear little aunt in the forest to ask for a needle and thread to mend a shirt?" "You must go along the road into the forest till you come to a fallen tree," said the stepmother, "then you must turn to your left, and follow your nose and you will find your auntie. Now off with you, lazy one!" She shoved a kerchief in the girl’s hand, into which she had packed a few morsels of stale bread and cheese and some scraps of meat. Inside the gates was Baba Yaga’s hut. It wasn’t like any other hut she had ever seen, for it stood on giant hen’s legs and walked about the yard. As Natasha approached, the house turned around to face her and it seemed that its front windows were eyes and its front door a mouth. 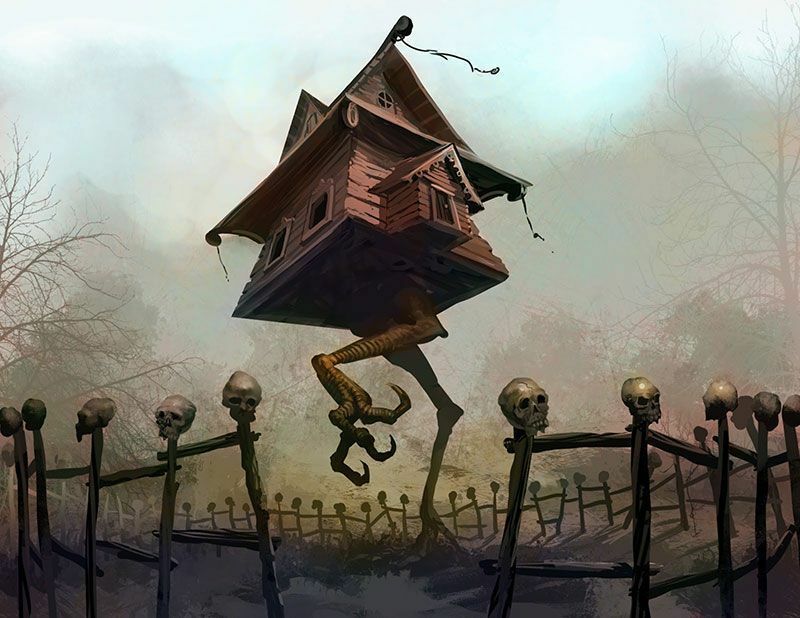 A servant of Baba Yaga’s was standing in the yard. She was crying bitterly because of the tasks Baba Yaga had set her to do, and was wiping her eyes on her petticoat. "How lucky," said Natasha, "that I have a handkerchief." She untied her kerchief, shook it clean, and carefully put the morsels of food in her pockets. She gave the handkerchief to Baba Yaga’s servant, who wiped her eyes on it and smiled through her tears. "How lucky," said the little girl, "that I have some bread and meat." Reaching into her pocket for her scraps of bread and meat, Natasha said to the dog, "I’m afraid it’s rather stale, but it’s better than nothing, I’m sure." And the dog gobbled it up at once and licked his lips. Baba Yaga whispered to her servant, "Listen to me! Make the bath very hot and scrub my niece. Scrub her clean. I’ll make a dainty meal of her, I will." When Baba Yaga went away from the window, the little girl spoke to the thin black cat who was watching the mouse hole. "Watching for a mouse," said the thin black cat. "I haven’t had any dinner in three days." 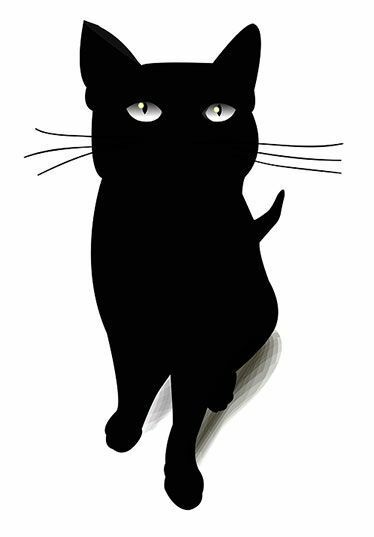 The thin black cat was whispered to Natasha: "There is a comb on the stool and there is a towel brought for your bath. You must take them both, and run for it while Baba Yaga is still in the bath-house. Baba Yaga will chase after you. When she does, you must throw the towel behind you, and it will turn into a big, wide river. It will take her a little time to get over that. When she gets over the river, you must throw the comb behind you. The comb will sprout up into such a forest that she will never get through it at all." "But she’ll hear the loom stop," said Natasha, "and she’ll know I have gone." "Don’t worry, I’ll take care of that," said the thin black cat. The cat took Natasha’s place at the loom. Then — how she did run! "That’s not the voice of my little dinner," said Baba Yaga, and she jumped into the hut, gnashing her iron teeth. There at the loom was no little girl, but only the thin black cat, tangling and tangling the threads! "Grrr!" said Baba Yaga, and she jumped at the cat. "Why didn’t you scratch the little girl’s eyes out?" "Ah!" trembled the servant, "in all the years that I’ve served you, you have never so much as given me even a rag, but the girl gave me a pretty kerchief." Seeing the gates wide open, she shrieked, "Gates! Why didn’t you squeak when she opened you?" "Ah!" said the gates, "in all the years that we’ve served you, you never so much as sprinkled a drop of oil on us, and we could hardly stand the sound of our own creaking. But the girl oiled us and we can now swing back and forth without a sound." Baba Yaga slammed the gates closed. Spinning around, she pointed her long finger at the dog. "You!" she hollered, "why didn’t you tear her to pieces when she ran out of the house?" "Ah!" said the dog, "in all the years that I’ve served you, you never threw me anything but an old bone crusts, but the girl gave me real meat and bread." "You’ll never escape me!" 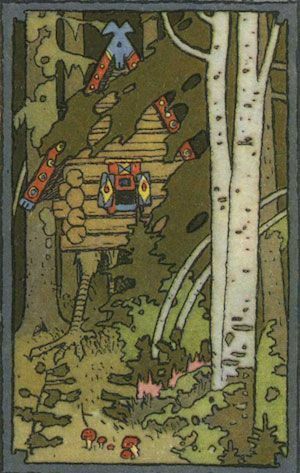 Baba Yaga laughed a terrible laugh and steered her flying mortar straight downward toward the girl. Natasha was running faster than she had ever run before. Soon she could hear Baba Yaga’s mortar bumping on the ground behind her. Desperately, she remembered the thin black cat’s words and threw the towel behind her on the ground. The towel grew bigger and bigger, and wetter and wetter, and soon a deep, broad river stood between the little girl and Baba Yaga. Natasha turned and ran on. Oh, how she ran! When Baba Yaga reached the edge of the river, she screamed louder than ever and threw her pestle on the ground, as she knew she couldn’t fly over an enchanted river. In a rage, she flew back to her hut on hen’s legs. There she gathered all her cows and drove them to the river. Natasha threw the comb behind her, and the comb grew bigger and bigger, and its teeth sprouted up into a thick forest, so thick that not even Baba Yaga could force her way through. And Baba Yaga the witch, the bony-legged one, gnashing her teeth and screaming with rage and disappointment, finally turned round and drove away back to her little hut on hen’s legs. The stepmother turned yellow when she saw the girl, and her eyes glowed, and her teeth ground together until they broke.